If 6 days = 1 year, then 5 days = 5/6 of a year, which is the same as 10/12ths of a year, which means 10 months. So, after a roughly 10-month equivalence in the cask, what does the sherry look like? In short, it looks the same. The glasses are peculiar for sherry, I admit, but they're the only two absolutely identical glasses I have. What can I say? I'm a bachelor. Matching glasses are not really high on my priority list. You should see my cutlery. In any case, the one on the left has been sitting in the cask for 5 days, the other has just been in the bottle. Sometimes I think there might be a wee difference, maybe that the casked one is a bit oranger and the uncasked one a bit redder, but they're still really close. If they aren't identical, the difference is so slight that is scarcely bears mentioning. The smell and taste are an entirely different matter. The raw sherry has a very powerful fruit-and-honey nose. Dried apricots, raisins, cherries...that sort of fruit - not fresh-picked, and not tart like apples or citrusy in any way. The casked sherry still has all that, but it's overlaid with a sledgehammer of char. The overall effect is close to burnt sugar. It's a strange combination of bouquets, I admit, but not unpleasant - just unusual and unexpected. In a taste-off, the raw sherry is much like it smells: very fruity, with an apple-juice quality that I quite like. Honeyed apples with dried fruit. Macintosh apples, not granny smith. Rich, rather than tart. The casked sherry retains all the characteristics I just described in the raw sherry. The big difference is that there's a strong charcoal taste over the fruit and honey. I know that charcoal, fruit and honey sounds remarkably unappetizing, but it's not disturbing by any means. It works, though the char tastes unintegrated with the fruit and sweetness; it's as if there were two layers to the palate, one of sweetened fruit, the other of smoke. Perhaps the strong charcoal taste is an unintended byproduct of barrel misappropriation. Sherry casks, called butts, are not charred as whisky barrels are - they're merely toasted according to the source of most of my wisdom about this sort of thing: Wikipedia. I'm not sure what the different between toasting and charring might be, but I expect it means that there's a significantly reduced amount of burnt wood in a proper sherry cask. 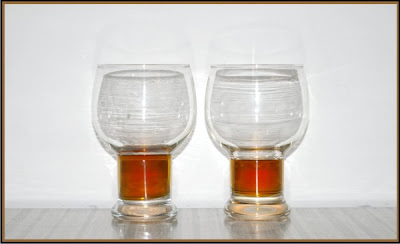 Sherry butts are also apparently a different size and shape, though I've not seen a photo of any for comparison. So, after a virtual 10-month-ish ageing, the sherry is just really getting more charcoal-ish and not changing in colour terribly much. I'll leave it in for another 5 days and write another blurb about the changes, if any, and at that point we'll see if I'll age it any longer, or go straight for the whisky. And if anyone out there knows what "toasting" is as opposed to "charring" I'd love to hear.